Product prices and availability are accurate as of 2019-04-12 22:47:42 UTC and are subject to change. Any price and availability information displayed on http://www.amazon.com/ at the time of purchase will apply to the purchase of this product. BatteryExtreme Racing BatteryExtreme Racing Battery; 1100 PHCA; 500 CCA; RC Min. 87; L-9.8 in. ; W-3.8 in. ; H-8.1 in. ; w/M6 Stud Terminals;FEATURES:Limited 3 Year Full Replacement Warranty3-10 Years of Service Life70 Per. Longer Cycle Than Conv. Deep Cyc. Bat.Can Store On Open Circuit Up To 2 YearsCapable Of 100 Percent Recharge In 4-6 HoursCan Be Mounted Any Position Except InvertedDesigned To Handle High Impact Shock/VibrationsExtreme Temp. Tolerant/Maintenance FreeODYSSEY, The Extreme Battery Some batteries provide enormous cranking power. Others, deep cycle reserve power. The revolutionary ODYSSEY battery is designed to do both. How is this possible? The answer begins with flat plates made of 99.99% pure virgin lead - not lead alloy. Pure lead plates can be made thinner, so we can fit more of them in the battery. More ODYSSEY battery plates mean more plate surface area. And that means more power - twice as much as conventional batteries. In fact, ODYSSEY batteries are capable of providing engine cranking pulses in excess of 2250 amps for 5 seconds - double to triple that of equally sized conventional batteries, even at very low temperatures. And they can handle 400 charge-discharge cycles to 80% depth of discharge. 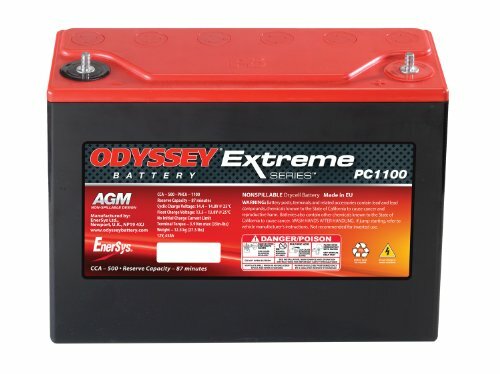 This extreme combination of power and performance makes ODYSSEY batteries perfect for a range of applications, including automotive/LTV, marine, commercial, and powersports.